The Kwikset brand is known for making doors locks that stand the test of time. Owners have raved on various websites about how amazing their Kwikset automated door locks function, as well as their durability. Now you can have that as a part of your ADT Pulse system. 1. Revel in users code bliss. Share just one or use up to 30 different codes. With a couple different codes, you can then see the history of what code was used at what times. If you have a teenager, you are looking for ways to monitor their activity, here's one more way; AND no more replacing the keys they loose. 2. With remote access you can let the in-laws in for their "surprise" visit with out having to drop everything and run home. Remote locking also gives you options. You can give Janelle the house sitter or Jeremy the contractor a key, assign them a code that can be changed after the job is done or have them text you to open up remotely. An option to fit every trust level. 3. You need this if you are that person. Mr. Latest and greatest. The Jones's look to you when setting the bar. Not a complaint, I married you Mr tall dark and techy, that's why we have these locks in our house. Explain to your loved one that there is something in your DNA that compels you to stop now and order an ADT Pulse system with these bad boys. 4. This is a convenient interior lock, as well. If you have a locked wine cellar, a home office, a panic room or any other locked portion of the home, this saves you having to yell for your child to come downstairs get the keys and bring them to you until you get frustrated with little Johnny's slow hearing and moving and get them yourself. 5. Backlit keys are highly visible in night or shaded areas. or worse, sit around worried that you didn't. Your ADT Pulse system allows you check any Pulse devices status and change it remotely, however, this lock also offers a "re-lock" feature. Simply turn it on and it re-locks the door 30 seconds after being unlocked. A locked door, day or night is always the safest option. 7. 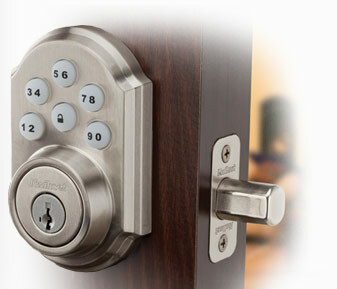 Don't forget, 25% off the locks with your new level 3 system in March. Then enjoy full integration with your ADT Pulse system. Using the web portal, you can set schedules like having it lock at 11pm every day. Set up automation where arming your alarm can trigger the doors to lock or unlocking the alarm can trigger a video clip of the entering party to be taken. Speaking of those video clips, set up an alert and have the clip sent right to your mobile device so you always know who is accessing your home while you are out, in bed or hard at work in the office. 8. The auto feedback option is irritating! In a good way. If you enter the wrong code, you can opt to have the lock give audible feedback. While this might appear a bit sassy for a lock to reprimand you for making a simple mistake, an unwelcome intruder should be quite turned off by the attention and simply leave. 9. It's a solution for the difficult door. The one where the lock's throw and the hole in the frame don't quite align. (I've dropped ice cream fighting that door.) Even if you just get the seasonal door-warp that make you have to give the door a little booty-bump and a half-jiggle. The tapered throw pulls the lock into alignment as it moves into the frame. 10. This lock also offers marital bliss... Every couple has a key looser. The one that is constantly pulling the cushions off the couch, dumping out the FOLDED basket of laundry (usually not folded by the key looser,) loudly rummaging through drawers while the big game is one or worse, standing in front of the TV frustrated with you for not helping find the keys. I am proudly no longer the key looser, and hubby is happily not interupted or expected to put down the lasagna and help me raid move the love seat to find it. and a BONUS to number 10, the SmartKey® Re-key Technology with BumpGuard Protection allows you to use an included tool to rekey your lock to any other Kwikset key you have (or any other one you can find) and still be protected against lock bumping. See the video below... cool stuff! For the month of March, receive an additional 25% off any automated SmartCode locks you decide to include in your new ADT Pulse Level 3 install. If you are a new homeowner this is perfect, it's the first thing you should do when you get a new home anyway! For more information or to set up a FREE Home Security Review, give us a call at 1-800-310-9490. Or click below and we'll call you back and and answer any questions you might have. See the SmarkKey Re-key technology in action. Re-key your home in 30 seconds! Perfect for when you move in, perfect for the new homeowner after you sell your home (alleviate the issues of random keys floating around) and even great for when you completely loose the key. Using any kwiket key, you can quickly and easily re-key this lock to the key you want and be on your way. By the way, over 50% of America has a Kwikset key in their pocket, you could re-key to your house sitter Susan's own key for the weekend and then switch right back!